Did you know you can actually wash your hair with baking soda? If you don’t want to fully embrace the “no ‘poo” trend and use baking soda as your only shampoo, you can just add a little baking soda to your regular shampoo to add a clarifying boost. It can help remove styling product buildup and enhance the cleansing properties of your regular shampoo. You might have heard about Epsom salt baths, but you can also add baking soda to your bath to help soften and smooth skin. It can also help if you have a sunburn or another minor skin irritation like bug bites. Baking soda is also great for whitening teeth naturally! Mix equal amounts of water, hydrogen peroxide and baking soda and then brush for one minute with your mixture. Do not swallow! Use it once or twice a week and it will help you whiten your teeth and remove stains from wine, coffee or anything else that stains your teeth. If you don’t want to wash your hair with baking soda, you can use it as a dry shampoo in between washes. Just sprinkle a very small amount onto your scalp and roots and then comb through and fluff your hair out. It will help reduce odors and excess oils so you can skip a wash (or two!). Make your own natural exfoliator. Baking soda is a great exfoliator for your hands and feet. Just mix with a little water to create a paste and rub onto hands and feet. Perfect for a girl’s night when you do mani/pedis! Baking soda is the perfect natural remover for self-tanner. Whether you want to remove it or made a mistake while applying, use baking soda and water to scrub it off. 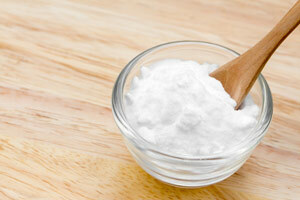 Did you know that baking soda had so many other uses? Which one will you try? Let us know!